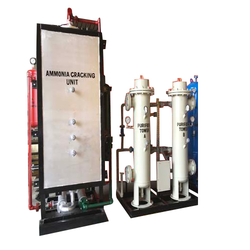 Manufacturer & exporter of High quality of Water Electrolysis based Hydrogen Gas Plants. Our Water Electrolysis based Hydrogen Gas Plants are competent enough to fulfill clients requirements on a better scale. Emerged as a manufacturer and exporter, we are engaged in offering our clients with a wide range of Industrial Hydrogen Gas Plants. Based on ammonia dissociation, these plants are widely used as hydrogen in mixture form or hydrogen after further purification and as pure hydrogen. Moreover, we provide these plants in different specifications to suit the demands of esteemed clients. We have brought forward PSA Hydrogen Gas Plants for our valued customers. These PSA plants are used widely for producing hydrogen gas of absolute purity. We have designed these plants as per the approved industry norms and thereby ensure our customers hassle-free operations and optimum performance. Easy to operate and maintain, these are our recommended products. PSA Hydrogen Gas Plants is a unique innovation by us and as the demand of enriched hydrogen from Ammonia Cracking units is required in many applications like SS annealing, SS brazing etc. and hydrogenation of chemicals & edible oils. 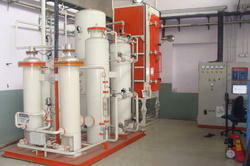 This is state of the art equipment which enrich hydrogen from the output of ammonia cracking units which is 75% to 98%. A special grade of zeolite molecular sieves is being used as desiccant using PSA technology. We have special clientele for this product. The equipment is much cheaper & less cumbersome and yet occupy little space as compared to water electrolysis based plants. Generally the plant capacities are ranging between 1 to 300 Nm3/hr. Molsieve is marketing PERIC make Hydrogen Gas Plants who have made Hydrogen Plants of capacities ranging from 0.5Nm3/hr to 600Nm3/hr. Up to now, the maximum hydrogen capacity of a single electrolyzer reaches to 600Nm3/h which is the largest one all over the world. Successively the hydrogen purification system have been developed and marketed for hydrogen generation plants, all of them are widely applied in different industrial sectors such as electron, electric power, steel plant, metallurgy, chemical industry, building materials, new energy resource, spacecraft, meteorology, etc. In order to satisfy the market, new kinds of plants have also been developed such as hydrogen generation plant by methanol cracking, hydrogen generation plant from natural gas, hydrogen generation plant by ammonia cracking, With the continuous and stable development of technology and products for more than 4 years, there have been complete products of hydrogen generation plants with different models and types to meet different requirements. The electrolyser is designed as bi-polar technology with pressurization. The performance of gasket is an important factor which ensures there is no leakage in the electrolyser. The gas-lye treater is of skid-mounted type with simple process flow, in convenience with assembly, operation and maintenance.The H2 generator is automatically controlled through PLC programming, with high reliability and remote control, HMI interface friendly to the operator with safety and convenient operation. H2 purity > 99.8%; O2 purity > 99.2%. H2/O2 purification system by catalyst is specially developed and designed for the gas generated by water electrolysis. As per the customer requirements, there are two kind of purification system, e.g. Dual Bed Adsorber type & Triple Bed Adsorber type. With these two different types, the H2 purity is better than 99.999% and dew point better than -70 Deg. C, in case of the chilled water to be available, the dew point can be better than (-) 76 Deg. C.
One key feature of such system is no loss of purified gas due to the special design. So the impurities can be less than 1 PPM of O2 in purified H2 or 5 PPM of H2 in purified O2. The switch-over among these dryers are fully automatic as per PLC control logic. Though both types of Gases can be provided however Molsieve restricts themselves to only Hydrogen gas. Containerised type plants can also be supplied depending upon Customer’s requirement. The Hydrogen produced is available up to 30 Bar pressure & can be stored as per Government’s rules & regulations.